This week, The Lion King was released in 3D. One of my earliest memories of seeing a film in the cinema, and 17 years later, it is just as memorable. This is the last Disney animated film to come out of the agonizing, mythical ‘Vault’. Having not seen it in ages, treating myself to the spectacle and booming music of this classic on the big screen was the way to do it. For those who unfortunately have never seen this, the story mirrors that of Macbeth, where in a young lion cub, Simba, is set to rule the kingdom after his father. His jealous Uncle Scar sets into motion a chain of events which leads to the banishment of Simba, and therefore putting Scar in charge. Unlike Shakespeare, hijinks, musical numbers and come-uppances ensue. There are many things to like and appreciate about this film, which was the pinnacle of the Disney Renaissance in the early ‘90s. One that is particularly impressive is the amount of memorable characters there are. Each and every character has wonderful moments, you have fun with them all and they have fantastic voice-work. It’s interesting to note that even though Timon and Pumbaa are often the most memorable, they only appear at the half-way mark. These 2 guys would go on to inspire countless of annoying, A.D.D., zany sidekicks in future kids movies, but that’s not their fault. Disney makes the wise decision to save the comedy relief until this half-way mark. They save the fun for later, when it’s needed most: right after the devastating ‘Canyon’ sequence. This sequence, which begins with the Wildebeest Stampede and ends with Simba’s banishment, is one of the best animated scenes ever, maybe even in any movie. There was loads of effort put in to animate every single Wildebeest, various effects (like dust/blur lines, alternating colour schematics), powerful camera movements, well-timed edited cuts that keep you on the edge of your seat, and this all leads up to the most chilling line of the film “Long live the King” followed by a (17 years later) still tear-inducing shocker. 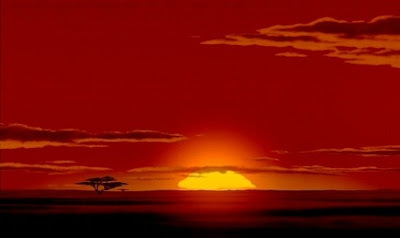 But there are plenty of other scenes that try to steal the show, whether it’s through music (Elton John’s powerful ‘Circle of Life’ and serenely beautiful ‘Can You Feel the Love Tonight’, as well as Hans Zimmer’s first mature score) or through stylistic decisions (in ‘Can’t Wait to be King’ the animals and backgrounds are designed with surreal African patterns, and try to count the ‘dutch angles’ in the song ‘Be Prepared’). Thankfully, The Lion King is not just style. There’s a plethora of themes that get dealt with. The effect the past can have on us, the boundaries and limits of power that are given to rulers, as well as the of connection between time and responsibility. Power must be earned through experience. Granted, not all of these are dealt with to their fullest, but hey, it’s a kid’s movie. Note: Although there were a few great scenes in 3D, like the stampede, it was also blurry at times, when the frames moved very quickly. I would recommend seeing it in 2D. Besides you’ll get to see brighter colours. Summary: This is the tops in terms of family movies. It’s fun, memorable, short, fast-paced and you’ll be singing the songs for days to come. The Lion King is up there with the best Disney films; the others being Fantasia, Beauty and the Beast, The Jungle Book and Bambi. Perched high on Pride Rock as my 37th favourite movie, this is one that will always be around.